Hmm. I’m thinking about TELLING US THE LINK! Well, you could add dark versions of the characters as bosses. You could make the world go into chaos as you walk and its bowser jr.
How about some mario statues in the background? 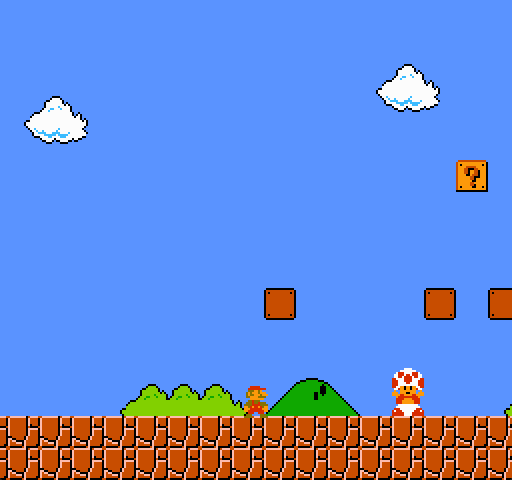 Wait… so if the blocks were orig Mushroom Kingdom folks, what were the pipes? I imagine you could make small city bgs with the castles similar to Zelda 2’s environments. Have birds flying in the background, maybe just “m”s. Also, Toad landscapers sowing grass, maybe Building toad houses? Yeah I know that’s the story for the original game, but not many people know it, and I think Nintendo abandoned the idea. I’m thinking that any pits could have bridges built over them.